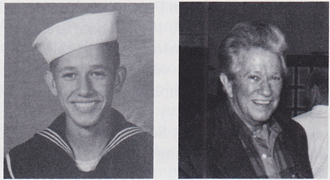 Jack G. Franklin, Boatswain's mate 1/c, born Jan. 31, 1924, Shawnee, OK. He joined the USN from Houston, TX, on his 17th birthday and was in the West Virginia Dec. 7, 1941, when she sank. Transferred aboard USS Minneapolis and participated in battles of Midway and Coral Sea. He helped commission the battleship Indiana, then sought more direct action transferring to landing crafts at Guadalcanal to make landings from Russel Island through the Philippines. Ending the war at Buckner Bay ducking kamikazes off Okinawa. On December 7, "Away Fire and Rescue Party" was sounded to help the burning Oglala. When SN Franklin rushed topside to man his boat station, the first torpedo bomber released his torpedo and banked to reveal the "Rising Sun" on his wings. Franklin ran to his 5"25 gun station and fired the only shot fired from the Starboard AA Btry. that day. He was suddenly elevated to "The Pointer" who pulled the trigger from a lowly "Hot Case Man." Released from the service in October 1945, graduated from Baylor University as a preacher in 1950 (was a "Holy Joe" in the USN) and is now an art buyer and gallery owner in Texas. Married five times and has seven children and two grandchildren.